I had the pleasure of attending last week’s “Moving Forward Together Conference on Climate Change and Social Justice”, hosted by the Nickel District Conservation Authority and the Greater Sudbury Social Planning Council, in partnership with the City of Greater Sudbury and the Greater Sudbury Climate Change Consortium. The Conference took a hard look at the anticipated impacts of climate change on residents in our City, and not surprisingly, determined that impacts would not affect everyone equally. I found the Conference’s lens through which climate change issues were examined locally took me out of my comfort zone, and challenged me to think about how social justice issues will be impacted by a warming world. I’ve attended many conferences on climate change in the past, most of which have an environmental or socio-economic perspective. The idea that a changing climate will impact equitable access to community services and emergency responses was something which had been at the back of my mind, but which I now I have a much better understanding of. As someone who has, in the past, hung out on the “environmental” side of things (although I’ve never identified myself as an “environmentalist”, given that I’ve always approached environmental issues from an economic viewpoint), I was also blown away by the level of organization and engagement our emerging partners in the social justice field can bring to the table. And that’s something for everyone who is concerned about the impacts of climate change to keep in mind. The conference kicked off on Thursday evening with a public session held in Council Chambers at Tom Davies Square. Dr. Liette Vasseur of Brock University gave a presentation on which focussed on the past 5 or 6 years which have led up to the creation of the Greater Sudbury Climate Change Consortium, along with the scientific assessment of climate change which Sudburians can expect to be impacted by over the next 90 years in low- medium- and high-emissions scenarios (as an aside, Dr. Vasseur indicated that we are currently on track to having emissions exceed the high-emissions scenario, which is troubling to say the least). Greater Sudbury can expect to experience some fairly significant physical impacts, which can be summarized as “hotter and dryer”. Although precipitation levels may increase in certain seasons, with the additional rise in temperature, there’ll be greater levels of evaporation, leading to lower lake levels, and less water for agricultural purposes (so although the growing season might increase by as much as 3 weeks over the next 90 years, crop yields may actually decline due to a lack of water). Currently, the City of Greater Sudbury experiences 5.5 heatwaves a year. We can expect a four-fold increase in heatwave days by 2070 (22.6 days), and by 2100, 36 heatwave days a year will be the new norm. Heatwaves, of course, significantly impact the young, the elderly and those with respiratory problems, along with those living in poverty who can’t afford air conditioning. Organizer and conference facilitator Mike Balkwill then delivered an excellent presentation about how change occurs very slowly…until it happens very quickly. While I understand well the concept of “critical mass” (or the “100th Monkey”), it was interesting to hear Balkwill talk about his own experiences juxtaposed against those leading environmentalists. His critique about environmental organizations often lacking the ability to plan to achieve a critical mass hit home, and while I’ve intuitively known that this has been the missing link of the environmental movement, Balkwill spoke with considered eloquence and challenged the audience to start thinking about where we have to go from here. Balkwill’s starting point was to acknowledge that all of the individual efforts which we can undertake to reduce our own emissions, while important, unfortunately will not save us from entering the dark territory of tipping points which will trigger runaway climate change. The need for action at the national and international level must accompany individual and community efforts, or else those efforts will be doomed to being overwhelmed and fail. Councillor Jocelyne Landry-Altman wrapped up Thursday’s session with some very poignant words about climate change, and how it is already affecting people living in Sudbury, often those living on fixed incomes and without the benefit of home or apartment insurance. Landry-Altman’s words were an appreciated and pointed wake-up call to those in our community and nation who seek to adopt a “wait and see” attitude towards climate change. Waiting for someone else to lead in our community, and on a national level, simply isn’t going to cut it any longer, as we are already feeling the adverse impacts of a changing climate. Over the next two days, participants identified that the most vulnerable in our society will experience the adverse impacts from a changing climate to a significantly greater degree than those with higher incomes. We often tend to think of climate change impacts only in terms of physical events (such as severe weather events like rainstorms or ice storms), or perhaps as systemic physical changes (such as hotter and drier summers, or an increase in catastrophic hurricanes over the years). What the public often forgets are the expected social and economic impacts which global climate change will have on people, governmental institutions, and the business community. Climate models show that the areas of the Earth to be most significantly impacted will be the polar areas and the tropics. We here in Greater Sudbury, from a purely physical perspective, will likely experience far less in terms of physical impacts. When it comes to social and economic impacts arising from a changing climate, however, no where on the planet will be immune, due to our globalized economy. As recent events in the Middle East continue to show us (as if we needed more lessons! ), what happens in one very far-away part of the world impacts us here in Greater Sudbury. Conference participants started using the term “global disruption” to describe the anticipated impacts that a changing climate will have on people, governments and businesses, because of the physical-impact-oriented nature of the term “climate change”. I think it’s an apt description for the kind of change that we’re likely going to experience in the coming decades. We can still affect how this kind of change plays out locally and globally, however we must begin taking action if we are to do so. In our changing world, reactionary decisions aren’t going to get us to where we need to be. It’s time to plan for the future. One of my biggest concerns with the global disruption we are already experiencing has to do with the rising cost of food brought on by shortages as a result of climate change-related crop failures, mainly in Australia, China, Russia and Pakistan. We are already seeing food protests occur in some parts of the world (Bolivia and Central America; as well, the protests in Cairo, Egypt, started in part as a result of the Mubarak regime cutting the bread allowance of ordinary citizens who rely on government-subsidized bread for the majority of their daily calories). Rising food prices might appear to be an inconvenience to most North Americans. Only those living on fixed incomes are likely to experience first-hand the consequences of more expensive foods. Fresh fruits and vegetables, and meats, will likely see the most significant rise in price, which means that those living in poverty will likely be forced to make choices for less nutritious food. Yet, we are all relatively well-insulated here in North American and Europe from the worst that rising food prices will bring. China, which faces national shortages of food, has already told its citizens that there is no need to panic, as it can afford to buy food on the international market. This will drive up prices even further, and will impact the poorest nations in the world more severely. While richer nations like China might be able to weather the food shortage storm this time at the expense of poor nations, there’s no guarantee that global food prices will ever recover, as the overall trend for food prices, like CO2 emissions, is onward and upward. What kinds of impacts might a starving world have on Canada’s economy? If our trading partners begin to go hungry, will they still want to purchase Canada’s raw materials and manufactured goods? We here in Greater Sudbury are very dependent on a global economy which needs our mineral resources for economic growth. What sort of situation might those working in extractive industries find themselves in should the global economy start to shrink as a result of higher food and energy prices? And that’s why we here in Greater Sudbury are not so very well-insulated from the adverse effects of climate driven global disruption. We in the middle class might soon discover just how close we are to finding ourselves in similar situations to those who are currently living in poverty. Greater Sudbury’s massive ecological successes are no secret to those living within our community. Over the years, and through perseverance and partnerships, our community has brought itself back from the brink of severe environmental degradation. But we’re pretty modest here in Greater Sudbury, I think. We don’t toot our own horn enough, and we’re certainly not ones to brag about the hard work and success that our regreening effort brought to our community. Yet, our story has started to creep out, and it’s not unusual today for those in other places, whether they are elsewhere in Canada, or throughout the world, to point to Sudbury as an environmental leader. Certainly, the resources which exist here in terms of human capital have positioned us to play a leadership role. With increasing national and international expectations that we do so, there is no way that we can shirk off our community’s role to be a leader in showing others the way forward. 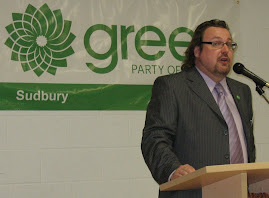 This past weekend’s conference is, in my opinion, another notch in Greater Sudbury’s leadership belt. Thank yous go to all of those involved, particularly the Conference organizers and leading agencies, including the Social Planning Council, the City, and the Nickel District Conservation Authority. Although he’ll never admit it, Myles Carter at the Conservation Authority deserves special recognition for overseeing how all of the necessary pieces of the Conference were brought together. Carter has done our community proud! There remains much work to do, locally, nationally and internationally. I know that I’ve already taken away from this Conference the means to think just a little differently about the things which are important to me and a majority of Canadians. I believe that Greater Sudbury can and will continue to be a leader for other communities throughout the world, who are only now starting to think about their own strategies to address their unique local circumstances. We must continue to share our stories, and build upon the incredible work and on our growing list of accomplishments. Leaders continue to emerge on Council, in our academic institutions, within our business and industrial sector, and within NGO’s and community groups, and within governmental institutions. Our economic and social health depend on taking action to address the impacts of climate change. We here in Greater Sudbury are positioned to lead, and lead we must and lead we shall. Although the future often seeks dark, it is what we will make of it. That’s why I’m so very optimistic that the future will be so much brighter than we imagine it. We truly can move forward together. Climate Change: Partisan Political Issue?